The first big wing has some nice soft lighting. What surprised me was the lack of a berserk pack trap, but I guess this is E2M1, after all. 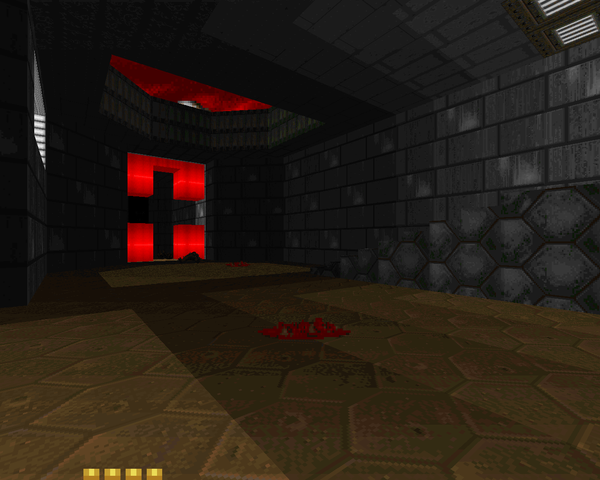 Grab it and make good use of it; you'll encounter several demons in this area, particularly with the yellow key trap, but nothing that dangerous. I still don't know how to get that automap. The yellow key area is pretty short, the main threat being imps on ledges. It also has the big Deimos homages, including the teleporter(s), the cherry red cross, and a plasma rifle secret. Raising the walkway is a nice way of evoking three-dimensional space. 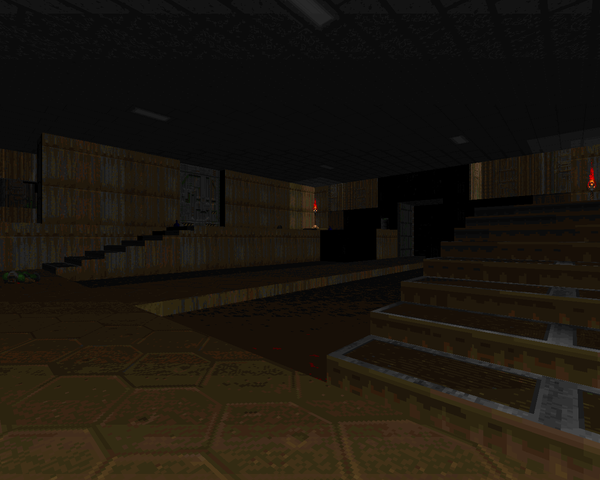 The final area (behind the red key doors) is pretty simple, but you can approach it from two different angles. 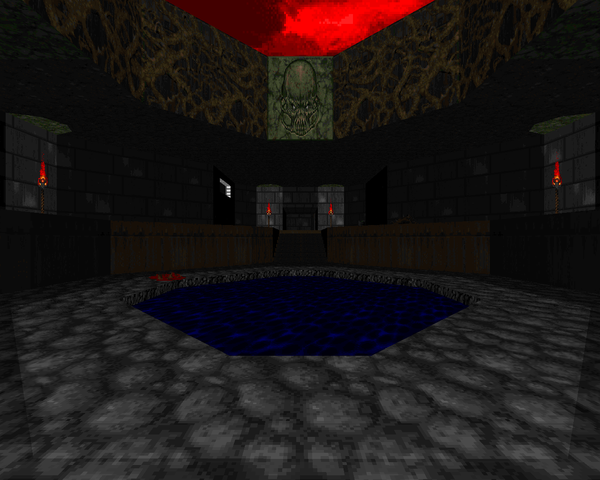 There's a walkway that disappears into the pool of blood (another bit from E2M1) and some inaccessible toxic piping on the west side, a nice detail. Flipping the main switch will of course reveal your final opposition, where pcorf lets the airborne enemies out to play. If you grabbed the plasma secret, it's a cakewalk. Otherwise, you might end up slightly pressured with your shotgun. A nice finale for a pretty easy intro map. 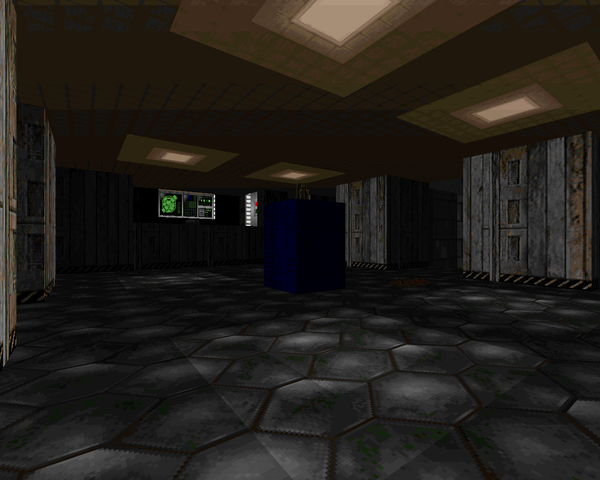 Deimos Entry is a little tougher than "Deimos Anomaly", I wager, but it's a pretty easy map overall, as it should be. Novices can run from the bigger monsters while veterans can smile at this pleasant bit of nostalgia (and maybe do a little speed running). It's got a pretty nice classic feel going, though with a couple of sneaky mapping bits that push it ever so slightly higher (a good thing). You should play it, unless you're one of those people who can't bear the thought of playing The Shores of Hell. Had a really fun 5 minutes with this map when it was first released, it has such a neat layout and a nostalgic but clean feel, and some relaxing gameplay. It's always nice when Paul drops these little treats, too bad he never expanded on it. He's made at least one full episode for all but E2 style.